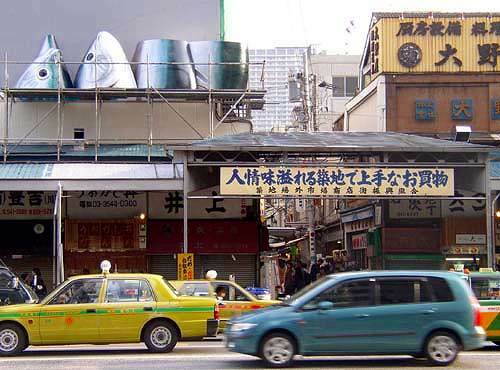 Tsukiji Fish Market, formally called Central Wholesale Market of Tokyo at Tshukiji, serves as the main market for the entire country of Japan. 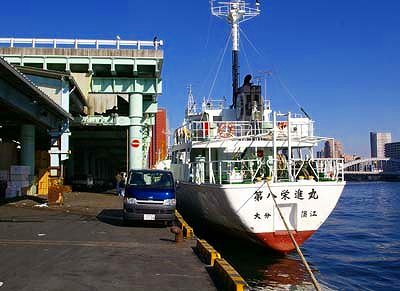 Trucks and ships bring in about 4 thousand tons of marine products and vegetables and they are dealt for 3 billion yen (approximately US 26 million dollars) every day. 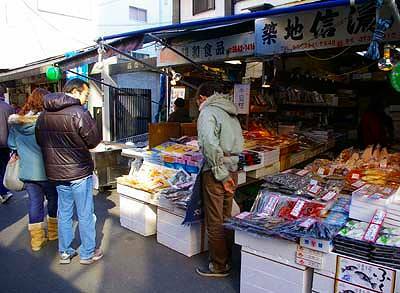 The history of the fish market goes back to the early stages of Tokugawa period. 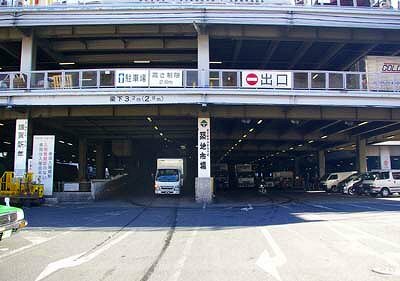 A market was opened by Tokugawa government along the north bank of Nihonbashi river at the same time as Edo started to be a big city. Fishes caught up in Edo bay were brought through the river to the market and unloaded there to be sold by merchants to everywhere in Edo. 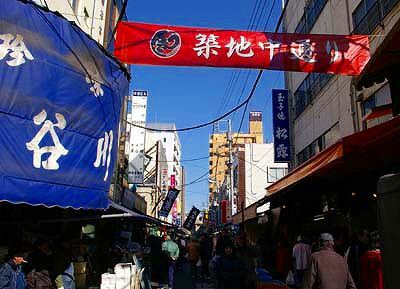 The more the Edo city developed, the busier the market became. This market existed to 1923 when the great earthquake destroyed it.. 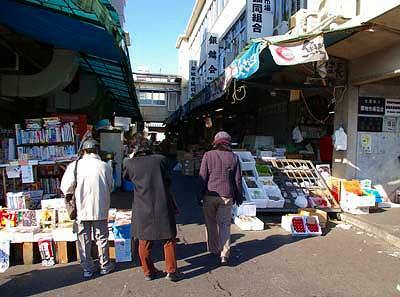 The market was relocated to Tsukiji on the land possessed by Navy after the earthquake. Today it covers an area of 230,000 sqm and about 70,000 people are working here on a busy day.. The market starts its business before dawn. and the auction begins at 5:00 am. 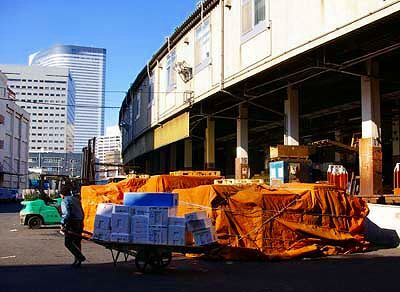 There are about 800 wholesale shops in the market. Each of them has a tiny space to sell the fishes just obtained through the auction. Most of the shops close around noon. 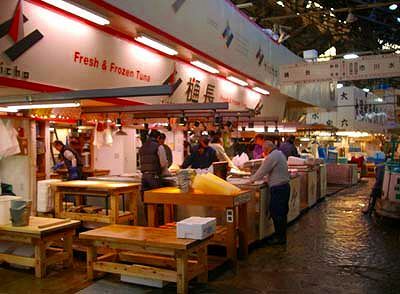 Ships also bring in the fishes to the market. 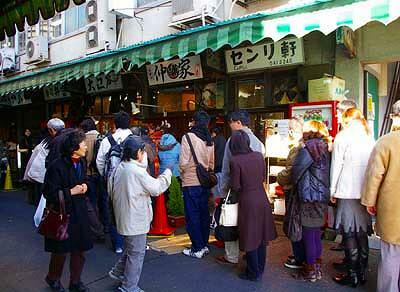 with people lined up waiting to eat in them as early as 7:00 am. 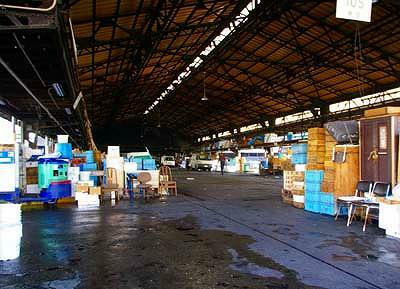 The outer market is located next to the inner market. 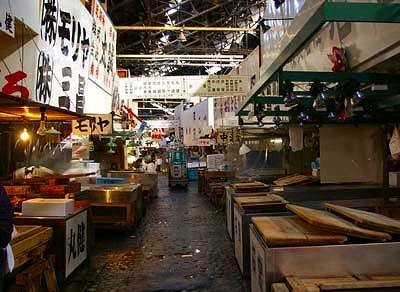 There are colorful stalls selling a large variety of foods and market related goods. 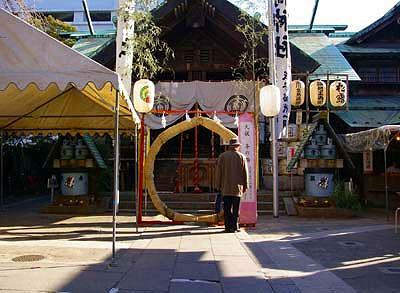 Namiyoke shrine is dedicated to the guardian God of Tsukiji. The interesting festival is held around here every summer.